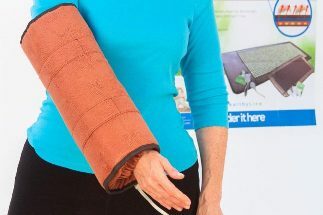 The special unique form mat designed by HealthyLine to fit arm, hands, and could be possibly used on legs as well if size allows. Pad itself is large 20″x 20″ and almost 10″ Velcro straps make it easy to put on arm of almost any size. This model promoting deep penetrating heat to those specific areas. This mat contains pounds of healing stones to further increase the general wellness experienced by the user. The stones in this mat are amethysts, tourmaline and obsidian. Each stone has healing properties for both the mind and the body. By combining the unique healing properties of all stones with the heat from the InfraMat Pro, the body experiences relaxing health improvement and a radically extraordinary detoxification.